511 Tactical 563200921SZ, 563201921SZ COVRT Box Messenger (56320) FREE SHIPPING! Whether going to work at the office or in the field, stay armed with the COVRT Box Messenger from 5.11 Tactical. Specifically designed for tactical operatives, the bag fits both 17-inch laptops and submachine guns. 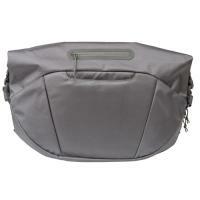 Dual full-length zippers combined with a horizontal bag orientation provide quick access to contents. An inconspicuous roll-top offers discreet item retrieval and sidearm quickdraw. A combination of Internal elastic pouches and MOLLE strips are ideal for securing pens, magazines, flashlights and other small items. The padded shoulder strap is secured with reinforced seams and military grade hardware to ensure maximum comfort as well as durability. Versatile, professional and discreet, carry a Mac or a MAC-10 in the COVRT Messenger and no one will know the difference. ©2002-2019 CopsPlus.com: 511 Tactical 563200921SZ, 563201921SZ COVRT Box Messenger (56320) FREE SHIPPING!